Mario Dones feat. Nick Pratt + Slo-Mo – Antarctica [LISTEN] – Be Fearless. Be Flagrant. 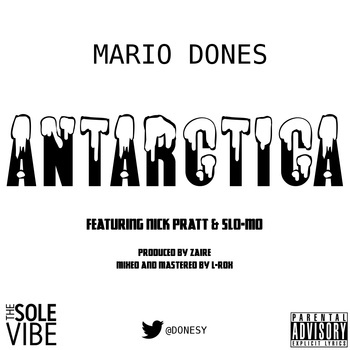 New music from Pittsburgh playa Mario Dones featuring Texas champ, Nick Pratt and Slo-Mo is a track called “Antarctica” and just based on the title alone, I don’t have to tell you that this song is cold. With Zaire back on the beats, Dones felt it was only right to drop off this joint which features his close friend, Nick Pratt and Mr. Motionopolis himself. Nick just dropped of a new video for his joint “Vices” – check that joint out below. The debut album is being finalized, stay tuned for updates and more new music.